The Inter-American Press Association (IAPA) is urging Bolivian President Evo Morales to comply with freedom of press laws and not stigmatize the work of journalists. “(We should) encourage the national government to comply with international treaties, the political constitution of the state and press laws that offer protection for journalistic work, (help them) avoid stigmatization … and also encourage the country’s justice system to sanction those responsible for attacks against journalists and media according to the current law, establishing the repair of eventual damages,” a statement from the association said. 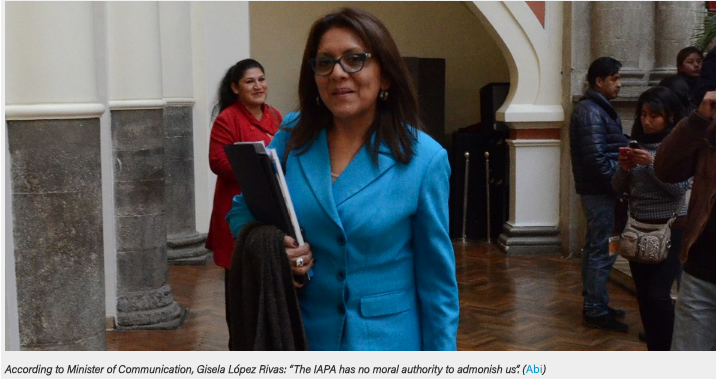 The Bolivian Minister of Communication, Gisela Lopez Rivas, accused the IAPA of “using the noble profession of journalism to attack the people’s revolution.” She has tweeted against the international organization and has denied requests to grant them protection in Bolivia. According to the IAPA, behavior of persecution and harassment manifests in physical aggression that, in some cases, has even resulted in murder. The association also reported that most controversial cases usually occur in Bolivia, Brazil, Colombia, Cuba, Ecuador, El Salvador, the United States, Honduras, Mexico, Paraguay, Peru, the Dominican Republic and Venezuela. The Bolivian Associated Press (ANP) acknowledged that verbal and physical attacks against journalists have increased. The latest case was reported by the Police Operations Tactical Unit (UTOP) when a television reporter was physically assaulted. According to the ANP, in 2014 there were 23 cases. In 2015 the figure rose to 28 cases, and in 2016 the number increased to a staggering 59 cases. Sources: Los Tiempos, El Deber. Bolivian Thoughts opinion: Like all populists and demagogue leaders of the “socialism of the 21st century”, this caudillo and his acolytes believe they are the only truth, the only savvy and therefore infallible … so they do not like criticism or being questioned on their accountability responsibilities. Bolivian press is under serious attack, either by veiled blackmail on how much propaganda will be place in the media … or physically assaulted. It is a disgrace, this government has done everything wrong since they seized power!